While a concussion, or mild traumatic brain injury (mTBI), is not a new clinical phenomenon, it has been getting extensive coverage both in the news and among clinical researchers. From the National Football League’s (NFL) top health and safety officer acknowledging a link between football-related head trauma and chronic traumatic encephalopathy, to a new campaign launched by the Department of Defense and being led by the Defense and Veterans Brain Injury Centers (DVBIC) encouraging military brain injury victims to seek help, mTBI has become a national public health issue. In an effort to accelerate mTBI research, diagnosis and treatment, GE and the NFL teamed up in 2013 to develop and improve concussion-detecting imaging technology by investing $40 million in research over a four-year period to determine key MRI biomarkers to improve diagnosis and target therapies. The two organizations also invested up to $20 million for an innovation program, Head Health Challenge, to help develop ideas for new or improved safety equipment. The National Institute of Health’s National Institute of Neurological Disorders and Stroke (NINDS) also supports clinical neuroscience research through grants, contracts, scientific meetings and research conducted in its own clinical and laboratories. For fiscal year 2016, of the nearly $1.7 billion appropriation provided to NINDS, the organization expects to spend $1.46 billion on extramural research—funding researchers and organizations outside the NIH. For years, neurologists and emergency physicians have relied on the Glasgow Coma Score, a neurological scale that provides a way to record the conscious state of person for initial and follow-up assessments. However, in the case of mTBI/ concussions, the Glasgow Coma Score may not be particularly useful.2 As a result, researchers are trying to understand the etiology behind mTBI in order to better diagnose and treat its symptoms, as well as recommend proper management of patients or athletes with one or more concussions. Many recent studies are utilizing diffusion tensor imaging (DTI), an MRI imaging method, to examine the brains of patients who experienced a TBI or mTBI/concussion. DTI takes advantage of diffusion anisotropy to provide details of the brain that enable examination of tissue microstructure and mapping of the orientation of the white-matter tracts. However, DTI is limited in its ability to demonstrate spatial and directional anisotropy, and therefore more advanced methods such as color coding and tractography (fiber tracking) are also being used to investigate directional. “We found that there are unique injuries underlying each unique post-concussive syndrome,and that we shouldn’t just think of concussion as a single diagnosis but rather an umbrella diagnosis that encompasses many different types of injuries,” she said in a statement. Dr. Alhilali is using a mathematical equation, Shannon entropy, to measure the complexity of the white matter imaged with DTI. With this technique, she has found that people who had a concussion also had significantly less complex white matter than people who did not have a concussion. 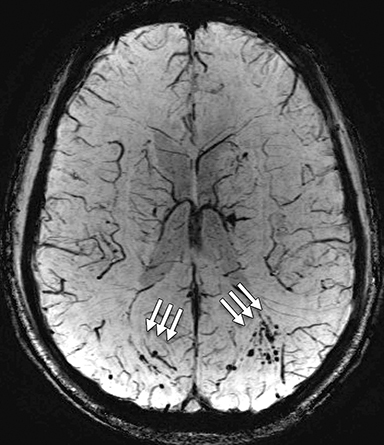 The less complex the white matter was in a person, the more symptomatic they were. One goal of Dr. Alhilali’s study, as well as other published studies, is to find ways to help clinicians understand the different symptoms that come with different injuries, and which patients are most susceptible to post-concussive symptoms. Establishing the diagnosis, predicting outcomes and separating the effects of mTBI from other conditions, such as post-traumatic stress disorder (PTSD), all remain challenging. There is also a desire to discover and/or develop more objective tests—such as an MRI biomarker—that can provide clinicians with a more definitive diagnosis of mTBI or concussion. For example, a March 2016 published study using DTI on Canadian hockey players found a significant reduction in myelin content in the brains of concussed athletes two weeks following injury.4 The myelin sheath protects nerves in the brain and myelin is damaged in patients with multiple sclerosis. However, the researchers also found that the myelin content recovered in two months. While more studies are likely needed, this finding could help guide management of concussed athletes, as they often return to play within two weeks of a concussion. In the largest study completed to-date on active military personnel using advanced MR imaging, the presence of white matter T2 hyperintensities, also known as brain scars, was detected in 52% of the subjects who had suffered blast-related mTBI.5 Gerard Riedy, MD, PhD, with the National Intrepid Center of Excellence(NICoE) and co-investigators imaged 834 military service members, of whom slightly more than 84% reported one or more blast-related incidents and 63% reported loss of consciousness at the time of the injury. He adds, “An objective measure of traumatic brain injury can lead to proper therapies.” In many instances of TBI, symptoms of PTSD may overlap, making it challenging for clinicians to deliver a definitive diagnosis. In many cases, treatments for TBI may not work for PTSD, and vice versa. Another just-published study on veterans diagnosed with mTBI found that loss of white matter integrity in a brain had a direct, measurable impact on clinical outcomes. Jeffrey B. Ware, MD, of the Philadelphia VA Medical Center, and colleagues retrospectively analyzed MR images from 57 military veterans who were diagnosed with mTBI. The average length of time between injury and post-deployment evaluation was 3.8 years with an average follow-up duration of 1.4 years. The study showed a strong association between initial post-deployment DTI, measurements and neurobehavioral symptoms, timing of injury and subsequent functional outcomes. Thanks to these clinical studies and the support of organizations supporting mTBI research, researchers and physicians are now armed with a better understanding of the clinical impact of a mTBI. This information is also being used to help guide concussion protocols for professional, collegiate and youth sports associations. While more studies are still needed, in particular examining mTBI treatment pathways, today there is a greater understanding of the injury and how it impacts the brain than there was just a decade earlier. Centers for Disease Control and Prevention, National Center for Injury Prevention and Control, Division of Unintentional Injury Prevention. Injury Prevention & Control: Traumatic Brain Injury & Concussion. Available at: http://www.cdc.gov/traumaticbraininjury/get_the_facts.html. Accessed April 1, 2016. Department of Veterans Affairs. Veterans Health Initiative, Traumatic Brain Injury. Independent Study Course. April 2010. Available at: http://www.publichealth.va.gov/docs/vhi/traumatic-brain-injury-vhi.pdf. Accessed April 4, 2016. Delic J, Alhilali LM, Hughes MA, Gumus S, Fakhran S. White Matter Injuries in Mild Traumatic Brain Injury and Posttraumatic Migranes: Diffusion Entropy Analysis. Radiology, Feb 2016. DOI: http://dx.doi.org/10.1148/radiol.2015151388. Riedy G, Senseney JS, Liu W, et al. Findings from Struc5. tural MR Imaging in Military Traumatic Brain Injury. Radiology.2016 Apr;279(1):207-15. Li S, Tian J, Bauer A, et al. Reduced Integrity of Right Later6. 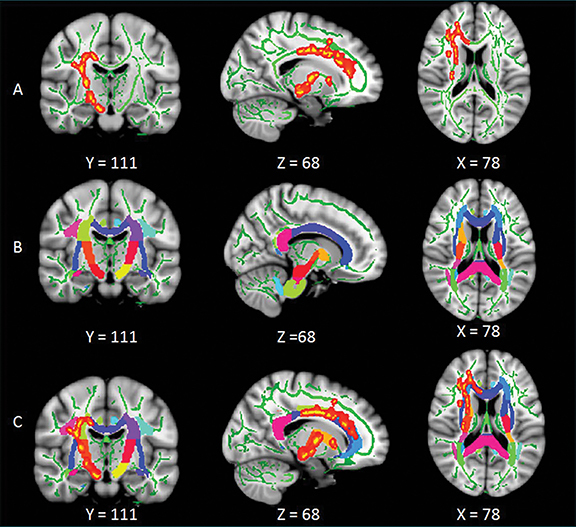 alized White Matter in Patients with Primary Insomnia: A Diffusion-Tensor Imaging Study. DOI:http://dx.doi.org/10.1148/radiol.2016152038. Massat MB. 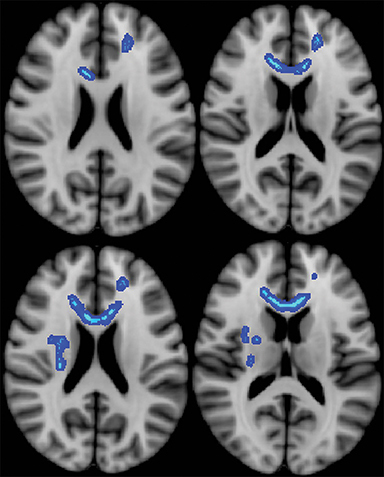 Diffusion tensor imaging sheds light on mTBIs. Appl Radiol. 2016;45(5):34-37.